DAY 41 – Farmers earn less than 30 cents a pound for organic quinoa. Home / Blog / DAY 41 – Farmers earn less than 30 cents a pound for organic quinoa. So what is the real cost of quinoa? Looking at the entire value chain of quinoa there are complexities and challenges in all directions from the world markets competing for consumer dollars to the producers themselves, scraping to make a living from an undervalued grain that is not covering its production costs. Here we will look at the quinoa value chain starting from the middle – the cost per ton for quinoa at the world market pricing of FOB from the Chilean seaport of Arica where sales are made to work markets. Quinoa price differences at the FOB point of sale form the Chilean port of Arica. Prices are from the end of January 2017 and vary depending on the quality and origin. Small grain industrialized conventional quinoa from Peru and elsewhere is selling at $1,900 per ton while conventional Bolivian quinoa is offered at $2,100 a ton. Organic quinoa that is largely only found in Bolivia and is most likely is the Quinoa Real variety is $2,350 a ton and the Fair Trade certified, organic Quinoa Real from Bolivia has a value of $2,600 a ton – a 27% higher price than the cheapest quinoa from Peru. In February Bolivia expects to have the European Community legally accept their Seal of Denomination of Origin for their Quinoa Real variety which has the distinct qualities of a large, creamy seed, the highest protein and mineral contents of any quinoa, is organically produced on small farms, and only grows within in a 30-mile radius around the salt flats. 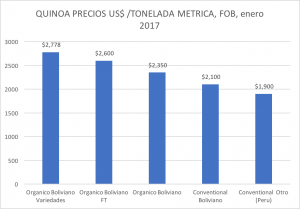 This can help to secure a new level of pricing for Bolivia’s quinoa, or at least make it more competitive in the world market at current prices. Fair Trade organizations, based in both in Europe as Germany’s World Fair Trade Organization (WFTO) and in the US as Fair Trade USA(FTUSA), are set up to protect farmers’ rights, grow community and ensure producers receive a living wage. Just recently Fair Trade has recognized Bolivian quinoa as a potential Fair Trade product and has been offering membership and price guarantees to Bolivia producers. Currently there are about 20 quinoa growing associations signed on as certified Fair Trade producers. This membership comes with costs and rules – organizations pay hundreds of dollars for audits and must uphold commitments to transparency, inclusiveness and democratic decision making. In addition to receiving a minimum price guarantee, regardless of market movements, producer groups also receive an annual premium based on a % of total sales that year. 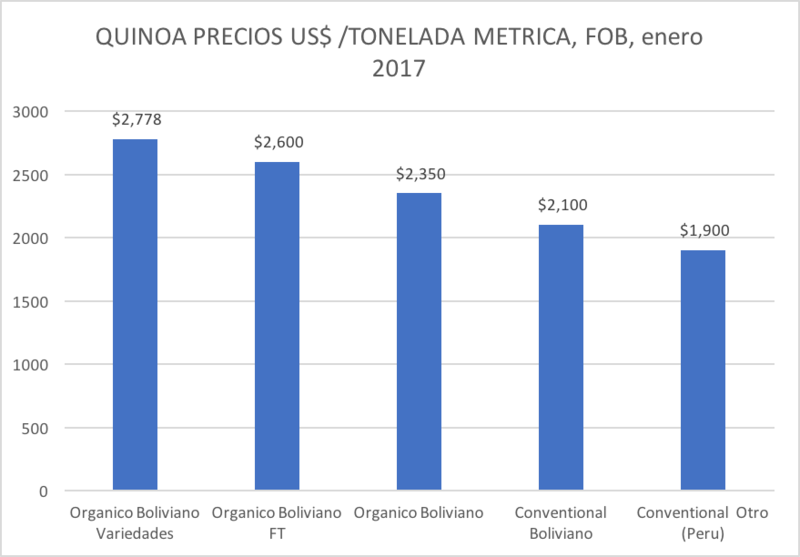 I will offer a value chain analysis of the current Fair Trace price of quinoa and see where it arrives both for the consumer and the producer to determine the fairness of that price. Next I will offer an alternative that can help farmers get what they consider to be a fair price, and what once was the Fair Trade minimum for quinoa in 2015. Price break out for a pound of Fair Trade, organic Bolivian quinoa sold to a US consumer in a local grocery store. 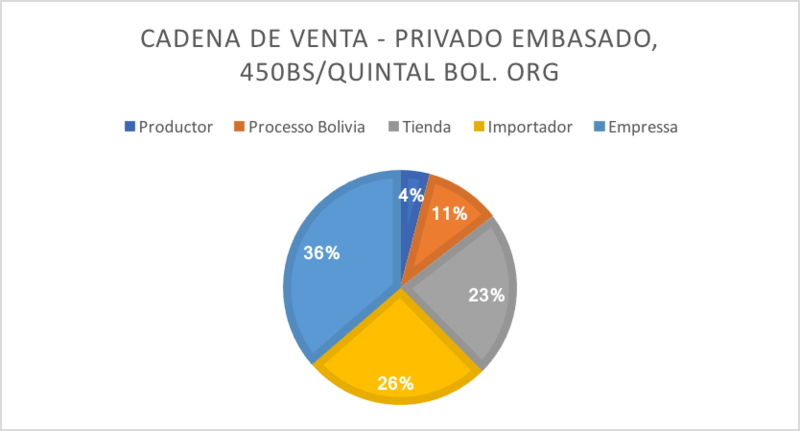 At $2,600 a ton FOB from Arica, Chile – Bolivia’s closest sea port, Bolivia’s Fair Trade, organic quinoa prices out at $1.18 a pound. Private Fair Trade companies are buying this quinoa from producers at 450Bs a quintal ($64 for 220 pounds) or $.29 a pound. This represents 25% of the FOB price. The rest goes towards covering the costs of commercial processing and cleaning ($.14 or 12%) and the administration, documentation and transportation from the farm to the plant to the port ($.75 or 64% of production). This same $1.18 a pound of quinoa is shipped by container to the US (in this case) where it is sold to wholesale buyers. The buyer (importer) sells the container of quinoa to large companies such as Pepsi and Kelloggs who then repackage the quinoa in small quantities under different brand names and sell it to stores who then place it on their shelves for consumer purchasing. Each step in the supply chain has its own price points. For example in the retail food industry the common store markup for packaged food products is 30%. Taking a $7.17 per pound price for a box of organic quinoa in my local food coop – which has a 30% markup on their packaged foods – we can work out way backwards to the FOB to see where costs are incurred in the quinoa value chain. The store gets $1.65 per pound on the product it sells (23%), the re-packager gets $2.60 (36%) which also covers the cost of packaging, branding and administration, the importer gets $1.86 (or 26%) which covers their administration, distribution and sales costs. 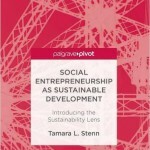 Hey Tamara, great post! I’m fascinated with what’s happened in Bolivia re: quinoa in the last 15 years. 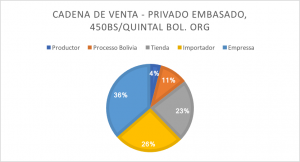 On one hand, Bolivian farmers seem to always get the short stick – and then also there’s the fact that many Bolivians can no longer buy quinoa themselves, because most of it is exported. It’s easier to find quinoa in the U.S. now then it is in Tarija. But, even though the farmers may not be getting a fair deal, prices are still much higher than they were before the export boom (at least that’s what I hear on the ground). There have clearly been both winners and losers in all of this. Thanks for the observation on prices. Yes, with the drop in quinoa prices, it’s easier for everyone to buy it. Though the upper class was easily paying the high prices just as well because it was fashionable t be eating quinoa! Unfortunately a sack of wheat from Anzaldo is worth double the price of a sack of quinoa from Challapata. So quinoa is not only affordable – it’s cheap – though the work and effort that goes into it. Quinoa is not valued here and the farmers can not put their own prices on the quinoa -it is determined by the Peruvian market and exporters.